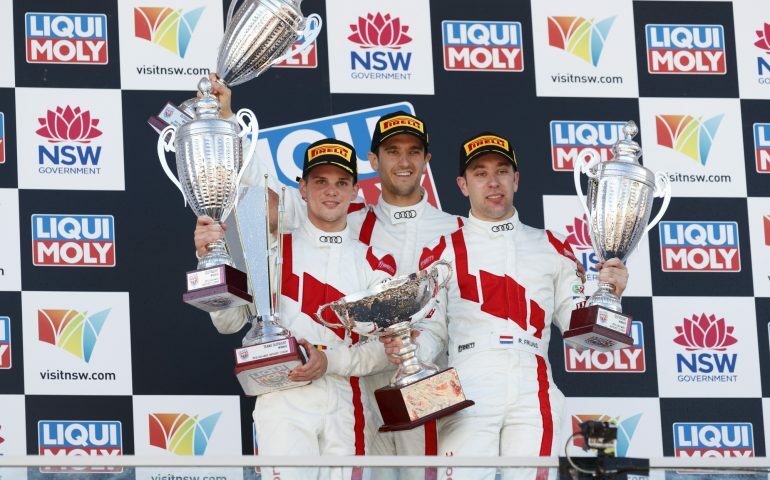 AFTER winning the 2018 edition of the Liqui-Moly Bathurst 12 Hour, Audi Sport Team WRT drivers Robin Frijns, Dries Vanthoor and Stuart Leonard have reflected on the victory as a meaningful one for team WRT. The Belgian squad shipped two its Audi R8 LMS GT3s to race in the Australian endurance classic last weekend, emerging victorious with the #37 car of Frijns, Vanthoor and Leonard in an action-packed, drama filled race. WRT led heading into the closing minutes of the race, though were unsure they had enough fuel to make it to the end under green flag conditions. The team’s luck changed though, when the race was red flagged and not restarted with 20 minutes still remaining on the clock, after a nasty crash involving three cars at the top of the Mountain. Frijns says the team, which made its debut on Australian soil over the weekend, didn’t expect to win the race after having problems at the beginning. “I think Jamie and me was fuel saving a lot,” he said. “I had a gap to him for about 3 or 4 seconds and I was trying to keep it. I was pushing but still I was trying to save as much fuel as I could, but I don’t think we would have made it if it was full out green, so we were hoping for a safety car. “Eventually the safety car came as it was unfortunately a big crash but it was alright. But I mean we are really happy. We didn’t expect it in the start, as we had all issues at the start, during the weekend as well. Co-driver Vanthoor says the win was a ‘good present’ for the team and its efforts to get ‘Down Under’ and participate in the Bathurst 12 Hour. “I think it means a lot for them[WRT], because their first time out here in Australia,” explained Vanthoor. “It’s a long flight, a long travel for them. I think it’s good that we gave them a good present. They prepared the race very well. They knew what was allowed and what was not allowed. “They did a good job, as well Audi, they gave us a good car to fight with and it was a roller coast race. The third driver in the combination, Leonard, enjoyed his first Bathurst 12 Hour campaign and says things became tense in the closing stages of the race. “I think our engineer has a bit of a headache right now as we were trying to figure out the fuel and what we needed to do and what needed to happen,” added the Brit. Race winners, the #37 WRT Audi, clocked 271 laps in a race time of 11 hours, 38 minutes and 4 seconds. The 2018 Liqui-Moly Bathurst 12 Hour event tracked a three-day attendance of 43,610, an increase of three percent from last year. Click here to view the full overall race results.